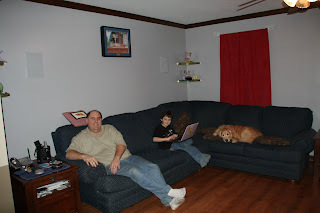 Here are the pics of the new floor and walls. The colors don't look the same in the pics. 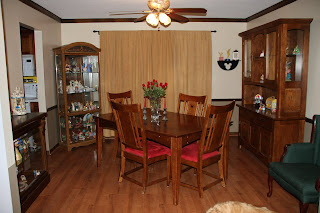 The dining room is a light tan on top and a dark brown on the bottom. The living room is a light grey. We love it. I still have to get all my stuff back on the walls but other than that we are finished. OH that looks fantastic!!! The dining room is my fav.....looks so classy!!! LOVE IT! GOOD JOB YOU GUYS! very nice. I bet it is nice to be done with carpet. It looks awesome!! 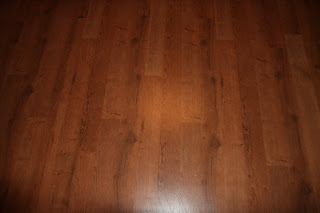 The flooring is so pretty! Good job! I like it a lot! I like the paint too. I like the lighter and darker browns. I am a brown person. That looks great!! I LOVE the colors in your dining room. Good job! 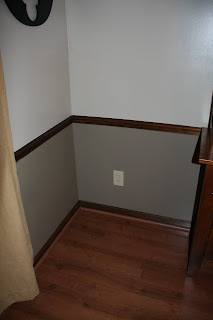 Love the molding and paint colors in the dining room!